Contact me if you are interested in reselling or getting a demo of the following sales tool discussed below. Let the client know that you will be discussing local search and how we are going to help them to increase their sales by increasing their visibility on relevant local search queries. Tell them you will be reviewing the three pillars of local search. 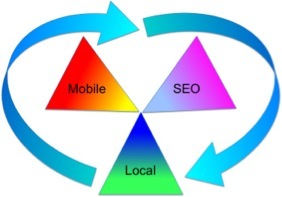 Which are mobile, local SEO keyword rankings, and local directory visibility. Ask if they have access to the Internet right now and tell the to go to "join.me." Explain what they will see and direct them to the Join section and give them your join.me screen share number. Ask if they can see your screen. If they can't access the Net then schedule a time to return the call so you can provide them with this important information about local search and it will increase their sales. Presentation objective: In this tab you want to first show how the client's website looks in the emulator. Most will just show a part of the home page or the entire page with no special mobile features like "click-to-call", "photo gallery", "custom menu", or other time saving/conversion making features. These features are designed to maximize the mobile user's browsing experience. For local businesses over 40% of site visits are made by mobile device users. Imagine the lost business by not having a mobile website. After reviewing the emulated site, shift over to the examples. Jon will put up three different types of layouts that are designed to optimize the selling features for that particular type of business. Specific mobile features will be highlighted for each example. Steer you client to the example that most closely matches their business. Mobile App: In addition to creating a custom mobile website for the client, we will also create a custom mobile app which can be downloaded from Apple "Apps" or Google "Play" store. The app will enable the client to "push" content to their clients and to offer a rewards program. Typical push content is notifications (sales, events, price changes, reminders, etc. ), coupons, and incentive based participation programs. The benefit is in having a direct connection with the client that transcends e-mail or snail mail. Communications can be extremely targeted and immediate. Customer loyalty is often increased and as a result, sales are increased. The cost of developing these types of application can be quite expensive, so to have something like this included in our basic package is a real plus for your client. Use examples like "SubWay's" new app for remote food ordering or find other compelling examples. Emphasize the power of client relationship marketing and explain how it has been reserved for only the larger corporations. 1. Do you see the difference between a mobile website and a standard site? 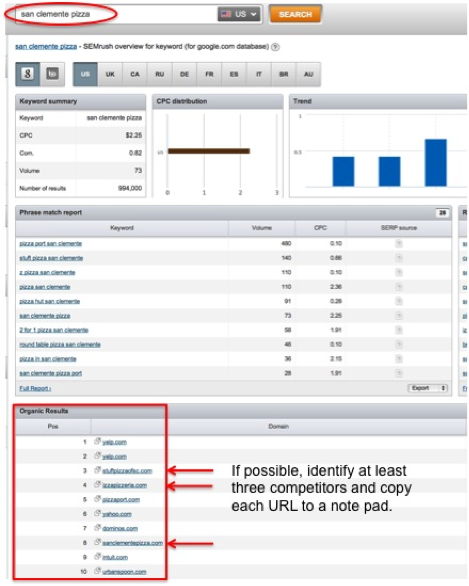 Direct the client to the "Organic Keywords" section and point out the number of ranking keywords they have. 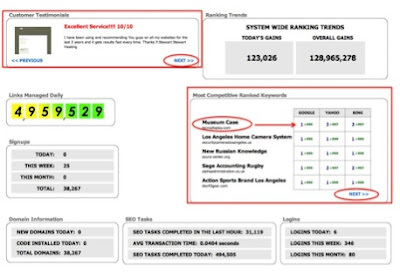 Also, point out the number of keywords in each ranking position range. Then direct them to the specific keyword phrase section. Determine if the keywords they are ranking for are the best for what they are selling. You must be able to quickly determine the highest converting keywords for each new client, regardless of product or market. In the example above, we are working with an Italian restaurant that specializes in pizza located in San Clemente, California. In this case, an obvious top keyword phrase would be "San Clemente Pizza" which they are not ranking for. So, let's go type that phrase into SemRush and see who is ranking. 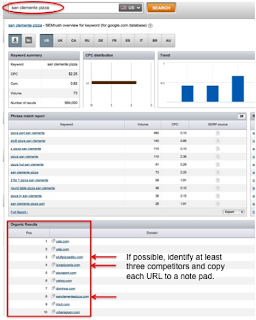 Once you have the three competitors URLs, and then go to the "Charts" section of SemRush (Located in the lower left column under the "Tools" header). Enter the client's URL and the other the competitors. Notice that you can select "Traffic" or a list of other search criteria. Once entered click the "Plot" button on the right. Now you and your client will see who is getting the most traffic. Then change the search criteria to "Total Keywords" and review "Who" has the highest number of keywords ranking in Google. The objective of this exercise is to demonstrate to the client where they stand relative to their competitors providing us with the opportunity to discuss how we are going to help them to compete. Another thing to notice about these to charts is the corollaries between keyword ranking and traffic. 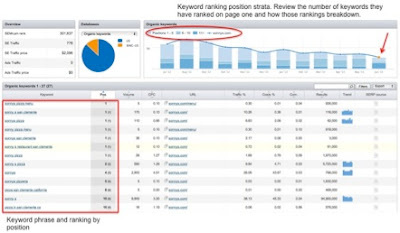 Sonny's (Yellow) has the most traffic volume and also has the highest number of ranking keywords. The reverse is true for San Clemente Pizza (Blue). So by now (Buy now), the client should have a general understanding of where they rank relative to their competitors. Our job now is to effectively demonstrate to them how we are going to help meet or beat the traffic and ranking status of their competitors. Our desire is to get our clients phones ringing off the hook! 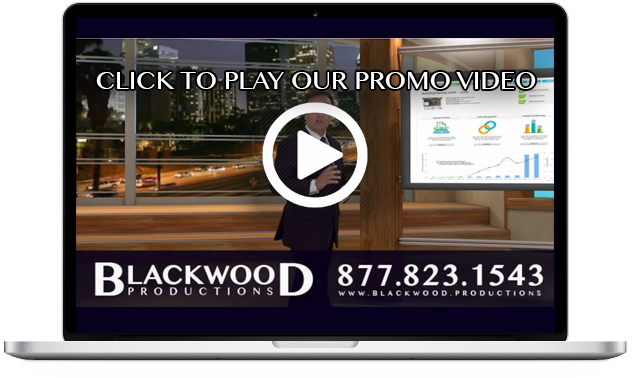 This brings us to Part – 2, the Blackwood SEO solution. This tab will open up with our "Results" page. I tell clients this is a real-time reporting portal into our system. Let the client know that we have over 38,000 clients. Tell them that before you explain the results page they are now looking at, you want to explain our SEO solution. Start with "We:"
· Write original content by keyword (500 words or more per keyword). This builds site authority for each keyword and ultimately for the underlying theme of the business. · Enable relevant linking with real (Unique "C" Class IP addresses) business websites like theirs. These sites pass significant amounts of link popularity, which builds trust and authority with the search engines. Start with testimonials and make clear that these are unsolicited. The clients made these comments on their own. Choose one testimonial and click on it to show it's a real account. Click "Next" to show there's more than one. Pick a keyword and click on the Google hypertext blue link to demonstrate the ranking in real. Click "Next" and repeat the process until the client gets it or says something like "That's amazing." Remind the client that we serve over 38,000 clients and these examples go on and on. 1. Does what I have explained to you make sense? 2. Can you see that by having the right keywords, combined with original content and relevant linking how your site would rank higher in the search engines? Pillar III Google Plus, Local Directories – How Do You Stack-Up? This is the third pillar out of the 3 pillars of Local Search we've been discussing. This is a critical pillar because it is the glue that binds and strengthens all three pillars. If you type in a company name and zip code into GetListed and the following comes up then the client has no local listings at all. This means the client has zero visibility locally and would indicate a strong need for localization service. If you get a score that's under 60 than the client still could benefit from our service. Remember claiming content authorship is also critical and it's not easy to do. Even if the client is already listed on a number of directories, including Google Plus, they still could benefit from authorship, YouTube, and more. 1. 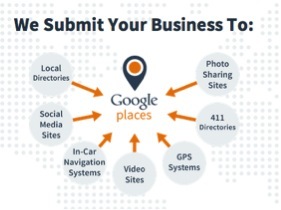 Google Places submission and optimization (Includes Google+, Google Local (Maps), Google Business Profile). The following graph summarizes our directory submission strategy and how it strengthens the client's Google Places account. The second list of directory sites is a breakdown of the actual sites we will be submitting by "Hand" and not by automation. Manual submission is an important distinction because it means the quality of their submissions will be very high. Here is a sample list of directories we hand submit to. Just scroll through the list slowly so the client can see and recognized the names. You may want to point out some of the more recognizable sites as a positive reinforcement of ALL they are getting. We also include hand written citations on the popular local directories to help improve ranking. Our citations are carefully composed to communicate the value of the product or service your client provides. Google Authorship: Claiming your content. The following is an example of the SEO ranking power created by claiming content authorship in Google. The keyword phrase I typed as an example below is "Search Engine Marketing Firm." We rank #1 on Google's first page for this keyword phrase. The #1ranking is there (And only there) because of content authorship claimed by Rob's Google+ account. We have found that by claiming content authorship Google passes additional trust to the associated website which can significantly boost ranking. 1. 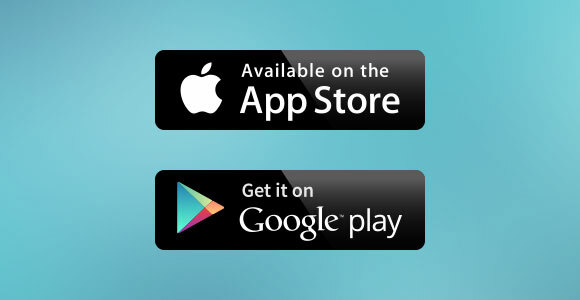 Can you see how local directory submission and promotion can improve you company's visibility? (If yes) And that increased visibility leads to sales? 2. Can you see how important it is to claim your content? (If they say yes… say "and that's what we will be doing for you"). Price: The price is a one-time fee of $995 and then a monthly charge of $199. This is a month-to-month arrangement. There is no contract. The monthly amount is equivalent to $6.63 per day - sounds like a very reasonable marketing budget doesn't it? Let's quickly review what we just went over (Go to below section "Begin by saying" section). We have just covered the three pillars of local search. Below is a graphical representation depicting each aspect of local search. All three need to be working together in order for the client to maximize their visibility (Visibility in search, Maps and local directories). Ask for the order: Review the important questions the client answered "Yes" to in the pervious sections. · And, you said claiming content authorship would help to boost your site on your local Google Maps? · When would be a good time to using the system? Why would you wait, when you are loosing business everyday? And for $6.63 per day your risk is very limited – will you be using a Visa or Master Card today? 1. 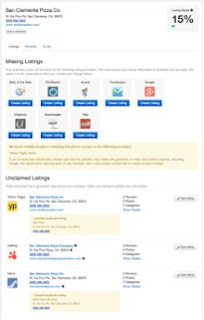 Claim and Optimize your Google + Local Page (Google Places) for your business. Add as many categories as possible. 2. Submit to Local Directories using a local business listing service like Local Site Submit or similar. 3. Make sure your website is properly optimized with content and meta data. 5. 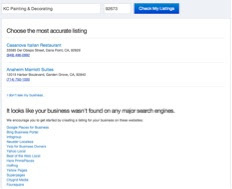 Our Local Business Listing service submits your business to 85 of the top sites.